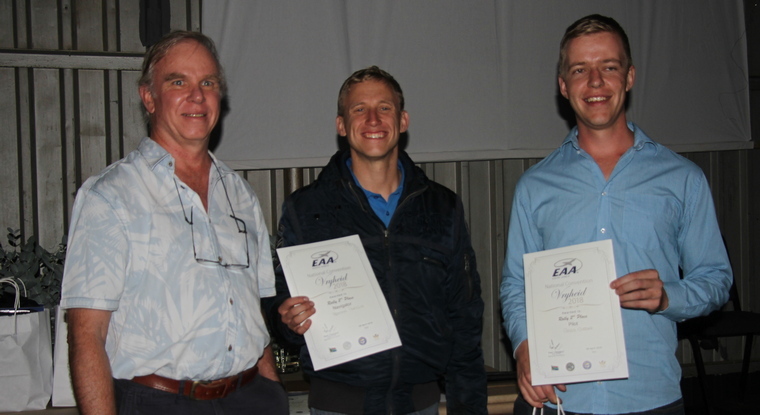 The EAA convention this year was held at Vryheid, which is situated close to the escarpment and in the heart of the Anglo Boer & Zulu war zones. 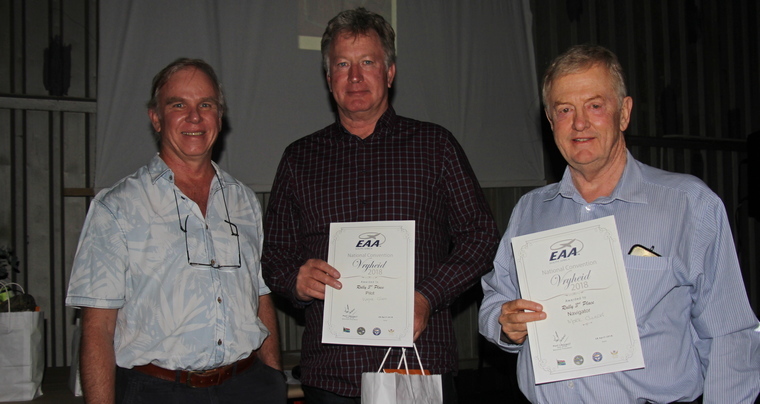 It was decided to hold an adventure format rally which is becoming a signature EAA event in conjunction with SAPFA, which is a format that EAA'ers enjoy, as a more relaxed fun kind of event mostly involving observation out of the window recognition of ground features and learning about the area being flown over. The Vryheid area is rich in history especially in the war times at the turn of the 20th century. 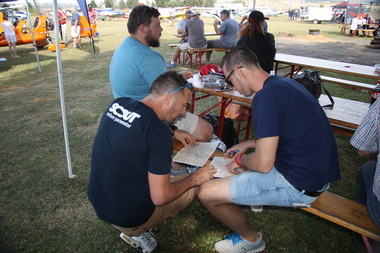 The Vryheid club were new to this type of event and a few members took part, as well as members from other local clubs and of course a number of EAA members. The theme for this event were following railroads and rivers, and finding a few battlefield sites. The route was mostly towards the north and west, in the mountainous areas of the region, but is also the most scenic area as well, which was one of the objectives for everybody to at least enjoy the local scenery. The route started at the local Klipfontein dam just south east of the airfield, and then in an anti-clockwise manner followed the railway line towards the northeast until it disappeared into the mountainside, and then continued to follow the railway northwards until the crossing with the Bivane river, where the teams had to follow the river westwards until they found a prominent farm house complex. From there southwards with no real following features to the Kambule Memorial site, which required recognition of a photo taken at ground level from the air. It was this part of the route that a few of the competitors lost their bearings given the wayward tracks see from the loggers. 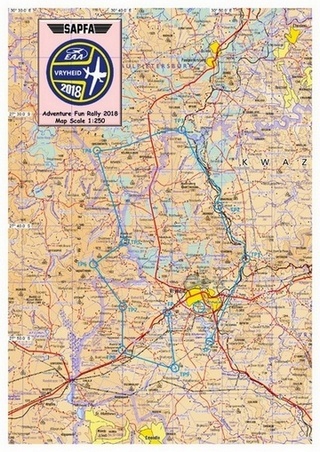 The competition map showing the route. From this first battlefield memorial, competitors had to climb a little onto a plateau to find the head waters of the Nsondo river at the top of the Aasvoelkrans gorge, and then fly descending into the gorge where three distinctive waterfalls could be seen, making this the most worthwhile scenic part of the route. At the bottom of the gorge another farmhouse was a waypoint and then to another battlefield memorial of Scheepersnek, and from there to a small farm dam to end off at the Stilwater railway station. As part of this rally, it was decided that to add some spice as well, to track everybody with loggers to check how accurately they fly to keep within a 1 km corridor, which should have been easy given that one is allowed to fly with GPS. The map and task booklet were provided 20 minutes prior the take-off for everybody to either plan their route with traditional map plotting tools or to program their GPS's - if they were more at home following the magenta line. Each route's leg had turning point photographs to be recognised (either being correct or incorrect), then a few questions had to be answered on ground features or sites that were historic or scenic, mostly cryptic in nature. The booklet contained a section of wiki notes that would enable the crews to answer all the questions - with a warning - "Don't read at your peril…. 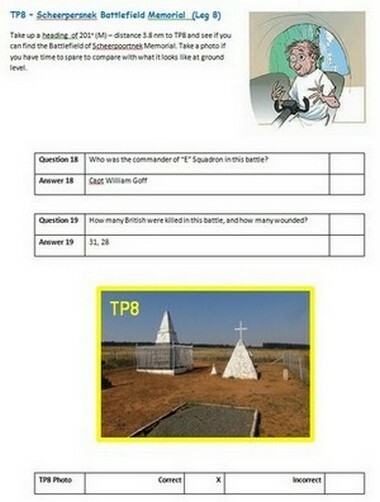 ", and guess what…., most forgot to find the answers in the most obvious place…. Some crews of course were googling for answers on their cell phones - because they can - somewhat inefficient given everything was right in front of them. There were 14 crews who registered by briefing time, with a broad spectrum of aircraft participating, from a fast Cessna 210 to slow open cockpit Bat Hawks. 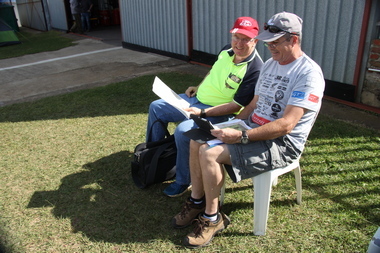 After the briefing, and with 20 minutes prior take-off of handing out papers prepared in sequence by Alan Lorimer, the first competitors took to the skies at 10:15, with the last off at 13.15. The weather was good for flying but the wind had picked up somewhat, which made navigation a little challenging. With everybody successfully home, it was time for marking the exam papers which was left to Clive King to do, and Rob downloading loggers, and then printing the results. 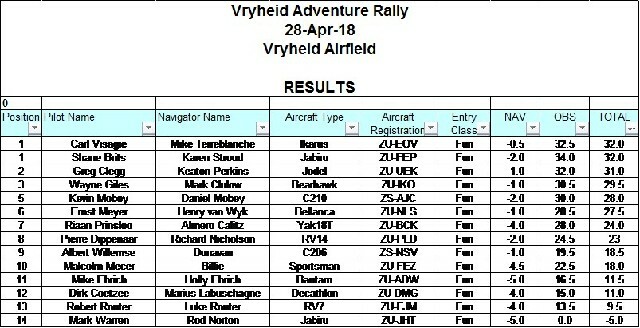 When all was tallied up, two crews tied for first place, Carl Visagie with Navigator Mike Terreblanche in their Ikarus ZU-EOV and Shane Brits with Navigator Karen Stroud in their Jabiru ZU-FEP. 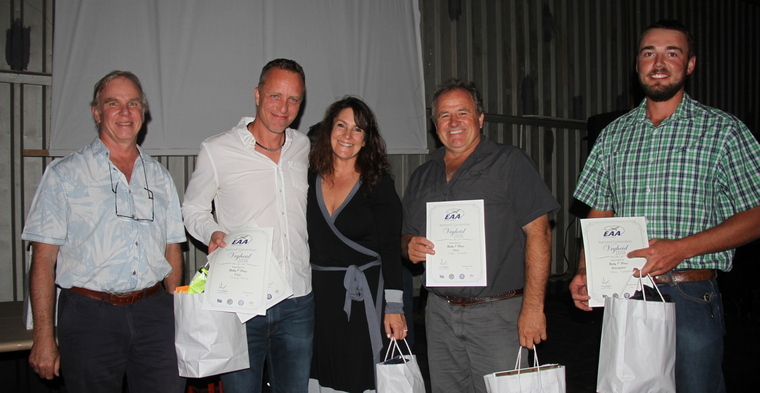 Greg Clegg and Keaton Perkins in a Jodel ZU-UEK attained 2nd place, with third place going to Wayne Giles and Mark Clulow in their Bearhawk LSA ZU-IKO. In the spot landing that everybody carried out after the rally, the winner was Mike Ehrich flying a Bantam ZU-ADW. Thus came to the end of a hopefully enjoyable day for everybody who took part, and given the interest in the event, should bode well for future rallies of this type and also gain an expression of interest in the more formal and timed rallies.